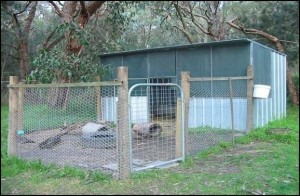 The enclosures pictured and described below are just an example of some of the types of enclosures that can be built to accommodate wombats. Some carers prefer to use corrugated iron around the sides instead of cyclone wire. Remember they need to be very strong. 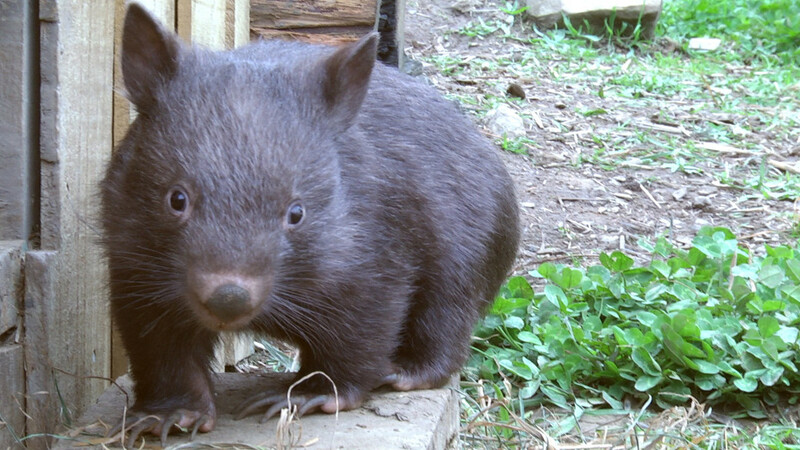 Wombats 3 – 4 kgs are an ideal size to move outside. The move to an outside enclosure needs to be done slowly. Locate the nursery enclosure in a quiet place and within easy access to your house. This way you can keep an eye on what is happening. 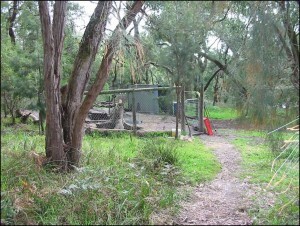 The enclosure needs to have a secure shed where the wombats can be confined if needed. 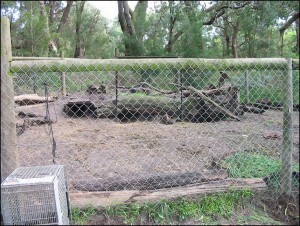 This type/size of enclosure should house the joeys until they are 12 – 14 months old. Shed size is optional depending on space available (2 x 2 metres approx.) The outside yard needs to be at least 3 x 4 metres in size. 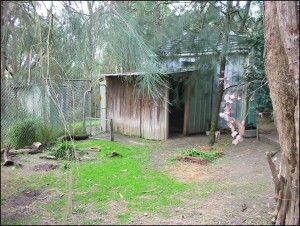 The floor of the shed and yard has to be covered with wire mesh to avoid the wombats digging out. Soil to a depth of approximately 6cm is then placed over the top. 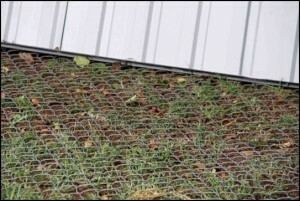 A strong fence using corrugated tin or cyclone wire which can be dug into the ground is advisable. 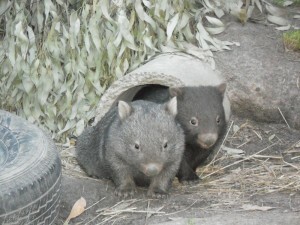 Wombats are very strong and their natural instinct is to dig and get under ground. 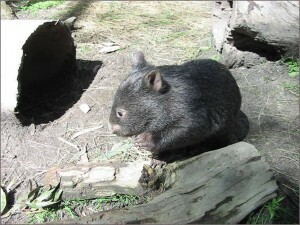 All outside enclosures need to be STRONG to make sure the wombats are safely contained. Give them a few nights where they are able to spend a couple of hours outside in the dark, then after a week or so you can leave them out all night, provided they are at ease. (Remember night time is their active time and this is when they are likely to get into trouble). Choose a calm night. Don’t leave them outside overnight until you are absolutely certain they are settled. 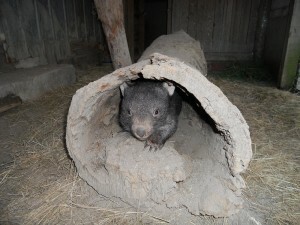 A large box with a lid, is an ideal substitute burrow where the wombat/s can retreat out of sight. The pouch can be hung inside so the joey feels secure. 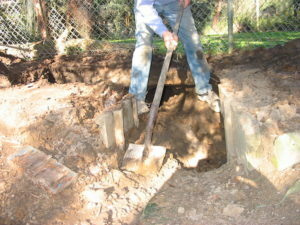 Provide an above ground pipe with a mound of soil on top. This can be blocked off until they become used to their new enclosure. 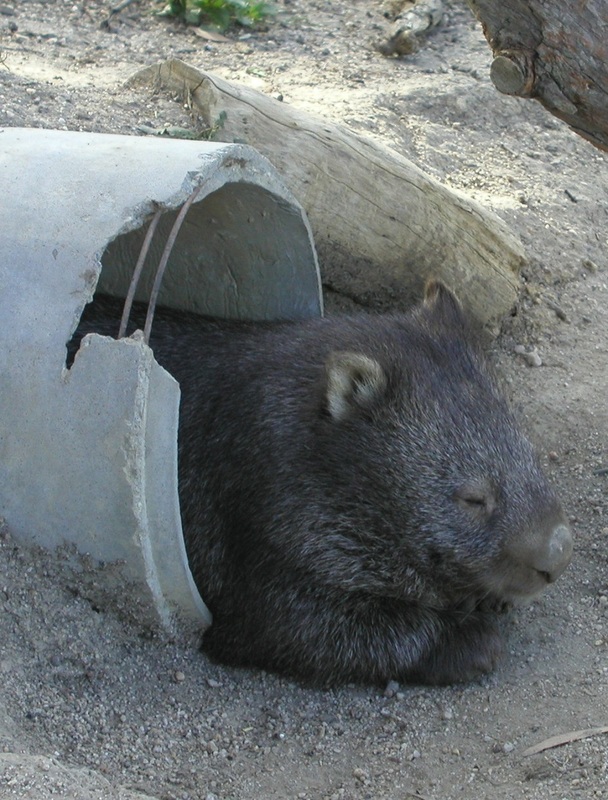 Wombats seem to know they belong underground so once they have access to a burrow they sometimes disappear and won’t come out, even for a bottle, so each new situation needs to be introduced slowly. Logs and branches and even an old tyre can provide entertainment. Always feed off the ground to avoid food becoming contaminated. An old plastic bread crate or something similar is ideal. A poo box should be provided. 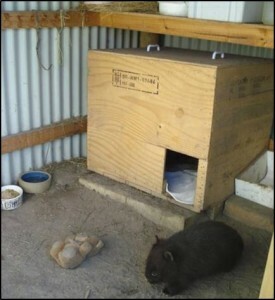 Wombat joeys can easily be taught to use a poo box (a cardboard or wooden box lined with newspaper is ideal). Place the box somewhere private. A dark corner is ideal.  When they wake up or after a feed place them in the poo box. A few of their old scats placed in the box helps them get the idea. When is it time to move to a bigger enclosure? An intermediate enclosure is a good idea as it’s a big adjustment to go from the nursery to the large Pre-release, non human contact enclosure. If this is not possible, the nursery enclosure must be large enough for them to dig a burrow. 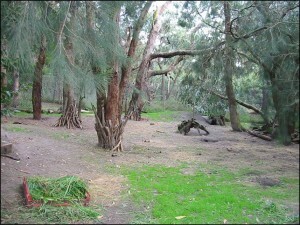 Intermediate enclosure needs to be at least 75 – 100 sqm. Final Enclosure – as BIG as your budget will allow, construction needs to be very strong and at least 150sq.mtrs or more in size. 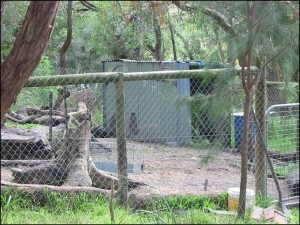 This enclosure must be situated well away from domestic noise and traffic. A deep underground burrow is an absolute essential. Rails on the inside at the top to stop them climbing over! Add something for interest – tyres, concrete pipes, logs, branches for climbing on, scratching and hiding under etc. Mesh or tin placed flat just below the surface for about a metre at the base of the fence will also help stop your wombat from digging out. 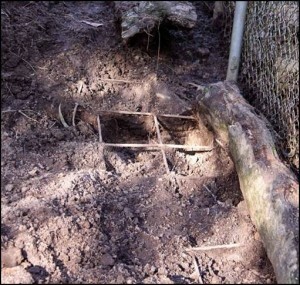 The mesh needs to be covered with soil to a depth of 15cm approximately. Ideally, wombats should spend the last 6mths at least in this type of enclosure situated in a secluded area where they can have several burrows enabling them to get away from each other when they choose. This is the time to stop all interaction with the wombats. 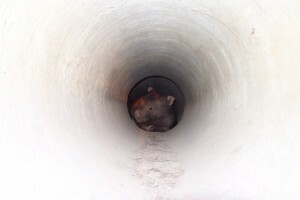 Cleaning and feeding should occur while wombats are underground. 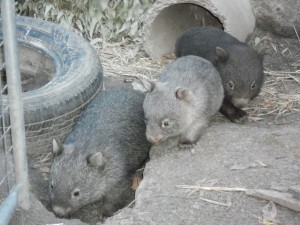 Wombats at this stage of their development are doing a lot of digging. You need to be prepared for a lot of daily maintenance on the enclosure. 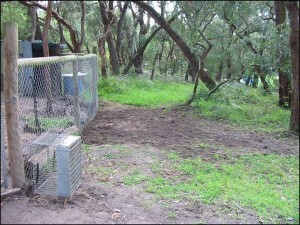 Above are examples of a pre-release enclosure with strong Cyclone wire fencing. 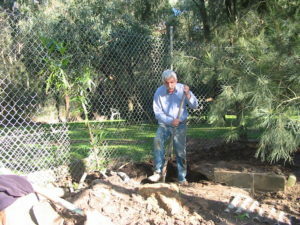 The fencing has been dug into the ground 35cm. One meter wide reinforcing mesh has also been laid down on the inside perimeter of the enclosure abutting the cyclone fencing. 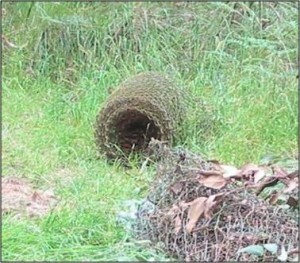 The mesh should then be covered with 10 – 15cm soil, this is usually enough to stop the wombats digging out. Wombats usually start digging on the fence line and then come across the 1 metre wide mesh which stops them from digging any further. 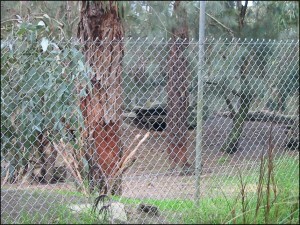 An enclosure of this size enables the wombats to have a couple of burrows and space to exercise. Always feed off the ground to avoid food becoming contaminated. An old plastic bread crate (as above) or something similar is ideal.